SAN DIEGO — Families will be surrounded by maritime history as tall ships take them back in time during the Maritime Museum of San Diego’s Festival of Sail, Aug. 30-Sept. 2. More than 20 tall ships and other vessels from around the world will visit during the annual event that is anticipated to bring more than 200,000 people to the Embarcadero. Mariners and children can enjoy three days of activities, tours and live music during the festival that will feature a petting zoo, traditional sea chanteys and cannon firings. An ocean of sails can be seen from the Embarcadero as Medea, Irving Johnson, and American Pride along many other historic ships will parade through the bay. The parade will officially kick off the festival at 11 a.m. Aug. 29. Ships should be docked by 2 p.m. at the Maritime Museum. Guests can spend time at the kids’ zone, the San Salvador village and build site, or catch live music at the Festival of Sail main stage. Attendees can shop for items among the more than 150 festival vendors who will be on site selling their wares, or grab a drink and a bite to eat from food vendors. Cannons will sound off during the festival as tall ships engage in staged cannon battles at sea. An additional purchased ticket is required for this show. The Festival of Sail is $5 for attendees ages 3 years and older. The fee includes admission to the Maritime Museum, a tour of the tall ships and access to the family activity areas and vendors. All ships will be open for viewing beginning at 9 a.m. Aug. 30. 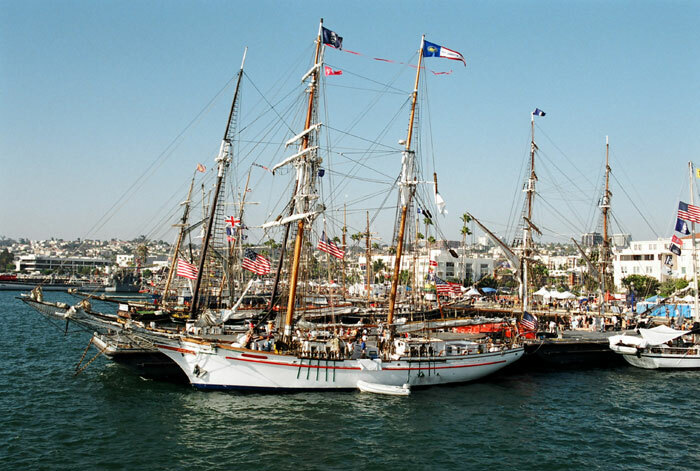 For more information about the 2013 Festival of Sail and a detailed schedule of activities, visit sdmaritime.org or call Robyn Gallant at (619) 234-9153 ext. 123. Proceeds from the event go to the museum’s education programs and toward maintaining the historic vessels.